A few years ago, I made a rather unusual decision for a sociologist of religion. I decided to write a romance for young adults – one that is, in many ways, linked to my academic research. I’m going to be honest: it wasn’t exactly a decision. It was something I sat down before dawn one November morning and started doing, despite the constant nagging feeling that this was a huge waste of time and energy because the story would never, ever be finished — much less published. The words I wrote in those pre-dawn hours eventually became my debut YA novel, Dream Things True. It tells of one Mexican-American family’s journey through immigration, settlement, adaptation, detention, and deportation. It’s told from the perspective Alma Garcia, an ambitious Latina on the verge of adulthood, and Evan Roland, the privileged Southern boy who falls in love with Alma, and who tries with all his might to help Alma preserve her humanity, her extraordinary individuality, andher dreams. When I began to write Alma and Evan’s story, I was a published author of two non-fiction books on Latin American immigration to the United States, a full-time college professor, and a mother pregnant with my fourth child. So, clearly, the decision was not one that I made because I needed a new project! I had plenty of projects. Looking back, I see two reasons that I needed to write this story. I work as a researcher, advocate, and service provider with undocumented immigrants in the U.S. South, and because of that work, I often get asked to speak to groups about the contentious topic of undocumented immigration. After several years of standing in front of crowds and sharing great quantities of data and information, I came to a realization: It’s important to know the facts, particularly when so much misinformation is floating around about the causes and consequences of undocumented immigration. But what people long for is the personal connection, the human story. I have come to believe that, in our polarized, fragmented society, we do not need more information. Our lives are saturated with information (and misinformation). What we need – what humans long for – is connection. I have been granted the privilege of building friendships with undocumented immigrants, of being a part of their lives, and of caring deeply for them. I have seen the struggles they face not through media sound bites and political rhetoric, but instead through the eyes of love. I wanted to give others, who may not have these opportunities, a chance to enter intimately into the experiences of undocumented immigrants and the people who love them. I wanted to build connection. That’s the first reason I wrote Dream Things True. The second reason was one I would only grasp in hindsight. I started writing this book during a very difficult time for undocumented immigrants in the South – when families I knew and loved were being torn apart by detention and deportation. I joined several friends and colleagues to develop a non-profit that works with immigrants in detention and their families. This work is, I believe, the most important work that I do, but it also breaks my heart wide open almost every day. Writing fictional stories about immigrants in crisis allows me to affirm and celebrate their resilience. It also helps me to process the emotion of accompanying these families through very hard times. I write fiction from a broken heart. Along the way, I have discovered some surprising similarities between writing fiction and writing academic non-fiction. Both are very hard work. Whether we want to do it or not, authors have to sit down and put words on a page. The professional practice of most good fiction authors I know is much like the practice of good academics: they are inquisitive and creative, and also structured and disciplined. They exist not in solitude, but in a community of people who share their passion and who support their efforts. Another shared quality is the need for rigorous research. When I began writing Dream Things True, I already had more than a dozen years of experience researching undocumented immigration and working with undocumented immigrants. Nevertheless, I had a great deal of additional work to do, if I wanted to get the story right. Perhaps it’s a sign of how profoundly complex immigration law is, but I consulted with several immigration attorneys and paralegals to ensure that the details of Alma’s story were correct. The story is “true” – not in the sense of reflecting one person’s actual experience, but in the sense of accurately characterizing the journey that Alma’s family would make through the labyrinth that is the U.S. immigration system. It’s not easy to write a scene at a lawyer’s office or in a courtroom that is both emotionally compelling and accurate, but I do my very best. One of the most amazing compliments I have received was from a colleague who worked for thirty years as the head of immigration legal services for a large non-profit in Atlanta. She told me that the story was, indeed, accurate (yay!) and that she wanted to make it required reading for every incoming attorney at her agency. She believed that reading the story would help them to remember the full, complicated, and profound humanity of each of their clients. This is the power of fiction. So I will continue my work as a scholar, advocate, and service provider with undocumented immigrants. And I also will keep writing love stories, because I firmly believe that love is more powerful than fear, and that thorny issues are best solved not from a place of fear but from a place of love. 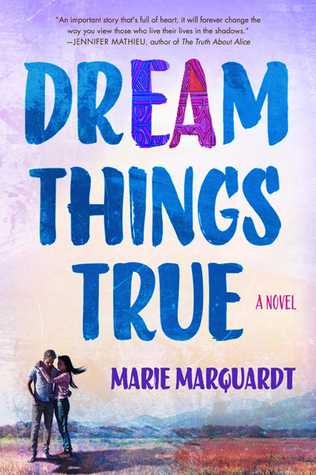 Below are six short videos of Marie Marquardt talking about her debut novel Dream Things True and her work with undocumented immigrants. Marie Marquardt is a Scholar-in-Residence at Emory University’s Candler School of Theology and author of contemporary YA fiction. She has written several articles and co-authored two non-fiction books about Latin American immigration to the U.S. South. DREAM THINGS TRUE (St. Martin’s Griffin/ September 2015) is her first work of fiction. She lives in a very busy household in Decatur, Georgia with her spouse, four children, a dog, and a bearded dragon. When not writing, teaching, or chauffeuring her children, she can be found working with El Refugio, a non-profit that serves detained immigrants and their families.